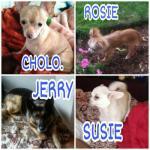 Systematic desensitization is a type of behavioral therapy use in all animals including dogs. It is design to help a fearful animal progressively relax in the presence something that causes fear, phobias or aggression. Dog trainers use this technique to help dogs that are afraid of certain objects, other dogs or even strange people. Systematic desensitization sounds like a mouthful! But if your dog is a fearful pet and this gets him into a lot of trouble this method will help you teach your pooch to be calm around fear or aggression triggers. The main idea is to progressively teach your pooch to be calm around the trigger, the key is to never make your dog react in a fearful or aggressive manner. The advantage of systematic desensitization is that it actually works and it doesn't use any type of punishment. Instead you use treats to help your dog be calm. The disadvantage of this dog training technique is that it takes a lot of time and patience, in some cases it also required big open spaces that are not always available in big cities. How do animals become fearful? Animals may become fearful through classical conditioning. Remember that we used classical conditioning to teach your pooch the meaning of a marker word (good dog!) by always following this word with a treat. This is a conditioned emotional response. After training, by saying the marker word we _make_ the dog feel "happy" (even when there is no treat coming afterwards). The opposite can happen as well. You can teach your pet that a certain stimulus is associated with something bad happening. If repeated often enough, the stimulus itself will make the dog feel fearful. For example, you take your pet for a walk every morning but every time another dog approaches you become tense and pull on the leash. After several weeks of this your canine friend starts barking at any strange dog. He has learned that other dogs make you tense and he gets a jerk on the leash, so he becomes afraid at the sight of them (even before you become tense and jerk the leash). Now your pet is afraid of other dogs! Some things can be so stressful that even one time exposure will make your pooch fearful for a long time. This is called sensitization. In dog psychology the term "sensitization" is used when an animal "over-reacts" to a certain stimulus (like a sound, physical touch, etc). This can happen when a stimulus that makes your hound emotionally aroused is repeated over and over again. But it can happen with a single exposure too. Examples are thunderstorms and gunfire. These are loud noises that might make your pooch afraid. If repeated, the animal might become even more anxious. Unlike classical conditioning, sensitization is not stimulus specific. This means that if a dog is sensitized (because he is at a fire range at the time) he might over react to other stimuli, like a person approaching from behind or a stranger trying to touch him. Fearful associations and phobias are very hard to undo, but with patience and practice it can be done. Systematic Desensitization is a method to use paired with Counter-Conditioning; it can be very successful. These are excellent products with proven good results, however there is no miracle cure for stress, a training program must always accompany any product used in dogs. Royal Canin Calm was created to help dogs relax, it is a diet enriched with tryptophane, an aminoacid required to produce neurotransmitters in the brain that induce relaxation and sleep. The Thundershirt was originally created to help dogs that are afraid of storms and fireworks, however, the calming effect of these dog shirt can be used in any stressful situation. The Dog Appeasing Pheromone is usually released by a dog mom with puppies and helps the babies calm down. This pheromone helps dogs relax and has no effect on humans, so you can plug it in safely. 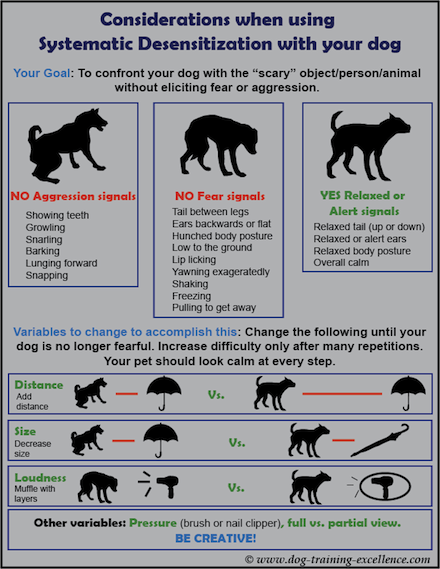 The number of steps you need when using systematic desensitization will actually depend on your particular situation and the level of fear in your pet. But the general idea is the same, all you need to do is learn to understand your dog emotional state (read about dog body language for help on this) and act accordingly. Systematic desensitization is the process by which you will expose your canine friend to the fear-eliciting stimulus (like other dogs) in a gradual manner. At every single step, the stimulus should be at a distance (or small enough, or quiet enough, etc.) that does NOT make your pooch react in any way (no barking, growling, freezing, or any other sign of stress). Step 1: I highly recommend you keep a log of each training session. 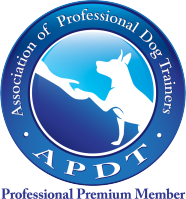 Write down the date, time and subject used for training (i.e., which other dog or person was helping you). Write down how your pet reacted the first trial and how he reacted the last trial during the same session. Then you will be able to see the progress across several training sessions, even if they are small. Step 2: You will need the help of a friend, family or dog training professional and their hound. Step 3: Bring both dogs together but ONLY at a safe distance. What is a safe distance? If your pet shows ANY sign of fear (barking, growling, freezing or any other type of anxious body language) then you are too close to the strange dog. Move further away. Make each step small enough that your dog doesn't react fearfully. Step 4: Now you will add to the mix counter-conditioning, which means to reverse a bad association to a good one. When your pet notices the dog in the distance but doesn't react to it, you can give him a treat, play fetch, or do any other activity he enjoys. Repeat...repeat...repeat! Note: I highly recommend you have a special sort of activity that your dog LOVES and save it only for this training sessions. That way the good feeling is even more powerful. He gets to play (or have his favorite treat) ONLY when another hound is in sight! Step 5: After many repetitions (it can take from several weeks to years) you will notice that your pet is completely comfortable when a dog is in sight (at the safe distance). He will even become excited at the prospect of his favorite treat or game as soon as he sees the other pooch. Now you can move a little closer…BUT CAUTION…do not move too close, you do not want your dog to react fearfully! Step 6: At the new safe distance use counter conditioning again. Step 7: Repeat steps 1-5 until you are side by side with the other dog. Step 8: Now repeat steps 1-6 with a different dog. Step 9: Now repeat steps 1-6 with 2 dogs at the same time. Step 10: The number of steps it will take depends on how fearful your pet is. It also depends on what he is fearful of. For example, if your dog is fearful of strangers, once you reach the point at which you are side by side with a stranger you might want to add more steps to get him used to be handled by them. Be patient, each step can take from several weeks to months, to even years. An important concept to understand is that a reactive dog will always be a reactive dog. 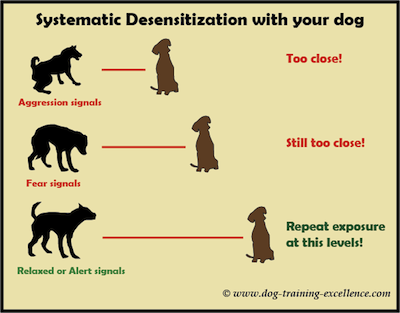 So, if you see a lot of progress with systematic desensitization, don't let your guard down, your dog may one day react again if conditions are right. Don't give up though, be consistent and you will see good results. Try using clicker training as well, this small noise maker device makes signals more obvious to your pet. Working with fearful dogs can be very unpredictable, so always make sure everyone involved is safe at all times. Find a professional in your area to help you along, seeing them in action will teach you a lot! 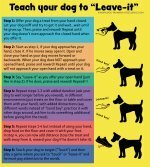 Teach your dog the command "Settle". Exercise and play with your dog daily. Give your pooch a healthy diet and look into diets design to calm. Leave any questions or comments on the box below or tell us your story here!